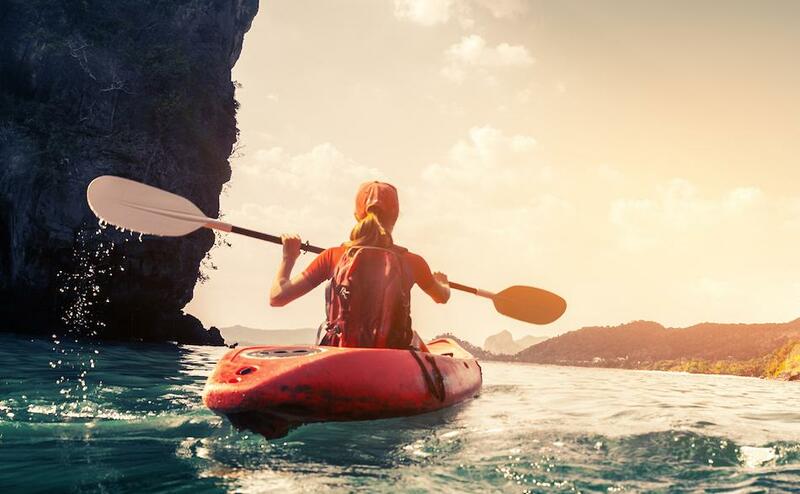 Kayak paddlers need high levels of aerobic power and anaerobic capacity, so concentrate on exercise that comes close to peak aerobic capacity. The exercises below were designed for competitive kayakers; you can dial back the intensity for recreational paddlers. Start with an aerobic exercise that can train you for a 1,000-meter sprint-kayaking competition. To closely match duration of 1,000-meter sprint, use 2-minute high-intensity work intervals followed by 2 minutes of low-intensity recovery. Warm up for 8–10 minutes. For work intervals, do 2 minutes of running, swimming or cycling to achieve exercise intensity of 85% of heart-rate maximum. Follow with 2 minutes of active recovery. Do 5 sets for 20-minute workout. Choose a resistance that will allow you to do 8–12 repetitions. Choose shoulder exercises that balance anterior, medial and posterior deltoids. Perform dumbbell front raise, lateral raise and reverse fly. Include chest press and bent-over row to strengthen the pectoralis major and latissimus dorsi, which are integral in kayak paddling. Complete 2–4 sets, at 8-repetition maximum (or an intensity of 8 on a scale of 10), 2–3 times per week. Sports training for kayaking can reduce mobility of the lumbar spine. This can create weak links in the chain of biokinematics connections and cause lower-back pain (Wojcik et al. 2011). Sit on BOSU®, with resistance tubing facing tubing anchor point. With both tube handles in one hand, pull side to side in spinal rotation movement. Maintain 50- to 75-degree tilt backward at hip to hold isometric contraction in rectus abdominis and transversus abdominis. For lateral flexion, turn away from anchor point, still seated on BOSU with upper body angled backward about 50–75 degrees. Perform lateral flexion with tube handles in hand, as if putting on brakes in kayak. Paddle for 60 seconds; rest for 30 seconds. Sit on BOSU facing anchor point, pulling away from anchored resistance tubing. Feet may be on floor or elevated for additional challenge. Simulate paddling movement with tube. This exercise can also be performed with the TRX® RIP™ Trainer tethered in place. Paddle against the tether using the bar. Competitive kayakers get their paddles in and out of the water quickly, with the paddle spending more time in the water than out. They want power when the paddle is in the water and a quick return when out of the water (McDonnell, Hume & Nolte 2013; Gomes et al. 2015). Recreational kayakers can benefit from the same power and speed. Partner A sits on BOSU, with feet on ground or elevated for more challenge. Partner B holds medium-tension resistance tubing at midway point while Partner A holds handles. Partner A paddles the resistance tubing, while Partner B varies resistance throughout paddle’s range of motion. Gomes, B. et al. 2015. Paddling force profiles at different stroke rates in elite sprint kayaking. Human Kinetics Journal 31(4). 258–63. Outdoor Foundation. 2015. Special report on paddlesports. Accessed Jan. 31, 2016. www.outdoorfoundation.org/pdf/ResearchPaddlesports2015.pdf. Wojcik, M., et al. 2011. Kayakers’ length of training period lumbar segment mobility and weak links occurrence in biokinematics chain. Chirugia Narzadow Ruchu i Ortopedia Polska, 76 (5), 256–61.